When I'm visiting CNC operations around the country, shop managers often start our conversations like this, "Labor is killing us. We can't find enough good operators and we're losing some of our experienced operators to competitors. What are my options?" The manager often goes on to describe operational issues related to labor that are typical in high-mix CNC manufacturing. Here are some automation options for CNC shops, specifically focusing on those processing parts in CNC milling machines with batch sizes between 10 and 1000 pieces. Designed for high part mix manufacturing environments, the VBX 160 can automatically tend virtually any part shape thanks to patent-pending MultiGrip jaws. Lean manufacturing principles are key to a successful high-mix part CNC manufacturing operation. Although lean manufacturing espouses many principles, the most important for high-mix manufacturing is elimination of over production. A lean manufacturing environment must be successful at producing many different kinds of parts in small quantities at a low cost. To do that, two things must be done well: low new-part-introduction costs and short part setup times. In general, there are two types of automation solutions for CNC milling applications: part loaders and pallet loaders. With a part loader, the operator stages the raw material in front of the automation and the automation loads the parts into and out of the CNC. With a pallet loader, the operator secures each piece of raw material to a pallet, and the automation loads the pallet into the CNC and unloads the pallet when the CNC is finished. Examples of pallet loaders include Horizontal Machining Centers (HMCs) and Vertical Machining Centers (VMCs) that incorporate a pallet changer. 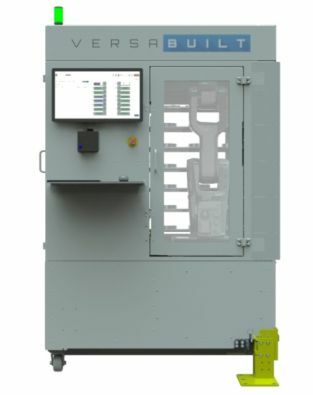 Examples of part loaders include the Halter CNC Load Assistant and the VersaBuilt VBX-160. Automation provides operators with flexibility to better plan their activities by significantly increasing the time between tending tasks. Custom robot tender options include the MT Series Robotic Machine Tender. When comparing a pallet loader to a part loader, the setup time needed to changeover the automation and CNC workholding must be considered. For pallet loaders, setup time is a function of how much CNC time it takes to changeover each pallet for the new part multiplied by the number of pallets in the automation system used to make the part. For part loaders, changeover time is dependent on the type of part loading system, but could include time for changing CNC fixturing, replacing robot gripper fingers, in-feed and out-feed changeover, re-grip station changeover and pick point calibration touchup. Automation does not eliminate operator labor, automation reduces operator labor. Both part loaders and pallet loaders increase operator efficiency by reducing wasted motion. An operator tending three CNC machines will spend a significant amount of time walking between each machine, opening and closing a CNC door for each part. Automation allows operators to work with parts in batches where they can be focused with less wasted motion and, generally, fewer opportunities for distractions. With a pallet loader, the automation loads the pallet into the CNC and unloads the pallet when the CNC is finished. 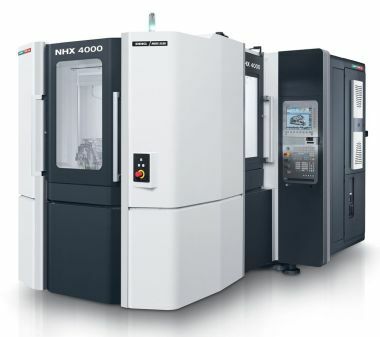 Two examples include the DMG Mori NHX 4000 and the Haas EC 400. When it comes to the labor required to load and unload the parts to be processed, part loaders usually require less operator labor than pallet loaders. To tend a part loader, the operator places a batch of parts in the part loader and then unloads a batch of completed parts. With a pallet loader, the operator indexes each pallet to an operator station then fixtures each part to a vise or other fixture on the pallet. Per part tending time is typically 10 to 20 seconds for a part loader and between one and five minutes for a pallet loader. Fully Automated or Half Automated? Another factor in reducing labor is whether the automation equipment is capable of processing each part "complete" without further operation intervention. Most parts require at least two operations, in other words, the part needs to be fixtured in two different orientations to complete the part. Some automation equipment is capable of performing both operations and other automation equipment can process only one operation before operator intervention is required. Although some part loaders can be configured for processing both sides of a part, pallet loaders are inherently limited to processing a single operation at a time. Automation that can process a part complete will usually reduce tending labor by more than half. Operators can easily call up stored part configurations for processing. One of the primary advantages of a pallet loader is that there is no need to develop a part picking process. The automation system of a pallet loader is delivered pre-integrated and tested, ready to load the same thing every time: a pallet. A part loader requires a part picking process to be developed for every part introduced to the system. Historically, developing a part picking process for each part introduced for automation was a high-cost proposition handed off to automation engineers. The new generation of part loaders has significantly reduced the engineering burden of new part introduction so that an average shop can easily create their own reliable part picking processes. For many years, the general consensus was that robotic part loaders were for single-part, high-volume applications only. The reason? We couldn't go out and buy robotic part loaders as ready-to-run products; they were fully-custom engineered systems. Several important technology advancements have changed that situation and there are now robotic part loading options that are not only viable for automating mixed-part manufacturing but may be superior to traditional choices such as pallet loaders. A robot-in-a-box is a new category of part loaders that has emerged over the past several years. 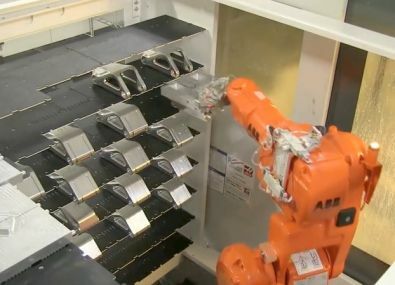 The robot-in-a-box is an attempt to bring the substantial labor savings of per-part tending of a part loader to the high-mix CNC manufacturing market. The part loader has significant advantages over the pallet loader in both fixturing costs and per order labor costs. To do this, robot-in-a-box vendors have standardized many, historically custom, aspects of robotic part loaders. Standardizations include caging and safety systems, art infeed and outfeed, robot programming and CNC integration. 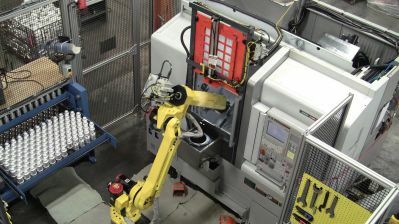 Robot-in-a-box products are typically configured with two grippers and easy-to-adjust and easy-to-change gripper fingers. One of the ways robot-in-a-box vendors have been successful at achieving low new-part-introduction costs and short setup times is to process a single operation at a time. By avoiding the first-operation-to-second-operation transfer, new-part-introduction design steps are eliminated and setup times are reduced when using traditional robot grippers. 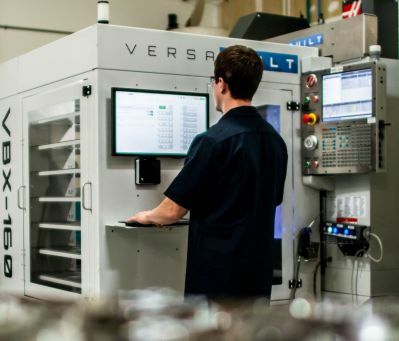 MultiGrip is a new automation workholding technology designed specifically for the automation of high-mix CNC manufacturing and available in the VersaBuilt VBX-160. MultiGrip combines the robot gripper and CNC vise jaws into an integrated system that combines some of the best features of a pallet loader with a part loader. 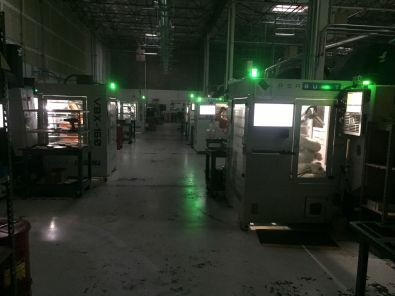 The primary goals of running lights-out are increased production capacity and equipment utilization, but these advantages can be lost without optimal automation. By eliminating robot gripper fingers, MultiGrip further reduces new-part-introduction design steps and setup time versus robot-in-a-box systems using traditional robot grippers. Another advantage of MultiGrip is that it is able to process multiple operations without operator intervention, reducing operator labor costs over other robot-in-a-box solutions. What's the Best Option for My Shop? Just a few short years ago, multi-pallet HMCs were the only choice when it came to automating high-mix CNC manufacturing. Through technology advancements, robotic part loaders have not only become a viable solution, for many CNC shops they represent the optimum option for automating high-mix manufacturing.